NOTE: The ongoing radiation storm has overwhelmed solar wind sensors onboard NASA's ACE spacecraft. Solar wind readings reported above are temporarily unreliable. 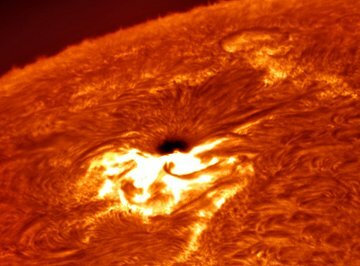 BONUS: Even between explosions, a lot is happening around sunspot 930, as shown in this movie from French astronomer Pascal Paquereau. To create the animation, he combined "17 pictures taken every 2 minutes through my Coronado PST." Photo details: Canon 300D, 135 mm lens, 1.3 sec, ISO 200. Tunz Tezel took this picture from Bolu, Turkey, on Dec. 7th. It merely hints at what is to come in the mornings ahead. 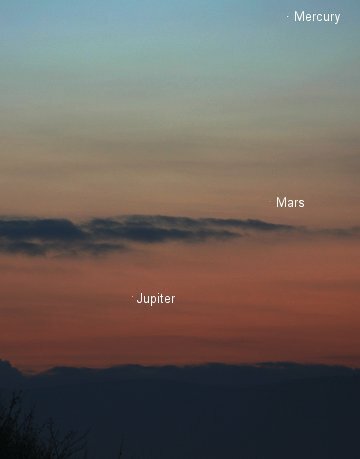 On Dec. 9th the three planets will form a tiny triangle about 1o wide. And on Dec. 10th, the best morning of all, Mercury and Jupiter will be less than 0.25o apart. The view through binoculars should be splendid. Don't miss it! Sky maps: Dec. 8, 9, 10, 11.